I won two samples of Wymm Tea in an Instagram giveaway. One, which I review here, is Tengtiao Black, 2015 Spring, and two is Lincang Daxueshan Laohuangpian, 2014. 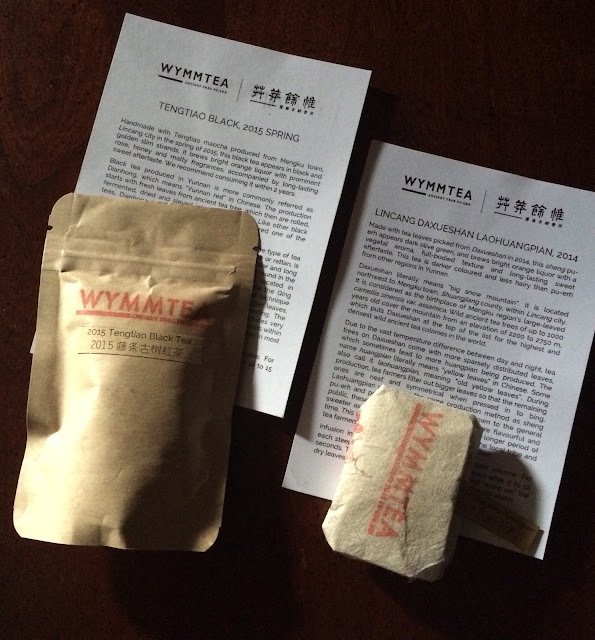 Last summer I reviewed the 2014 Mango Tengtiao, a sheng puerh, also from Wymm Tea. Because of my enjoyable experience, I was eager to try the black Tengtiao. I won't keep you in suspense. I prefer the Tengtiao sheng, but this black is a good tea. The leaves are a pretty mix of golden and dark slightly twisted strands. The wet leaves have a pronounced floral aroma. I don't know how else to describe the flavor of the liquor except to say it had a dark taste. It was an unexpected flavor because the color of liquor is not particularly dark. As you can see in the photograph, the liquor is orange-red. The liquor was slightly bitter but not unpleasantly so. Also, it had a lingering dry finish. I didn't get the the sweet finish mentioned in the official tasting notes. One of the things I like about Wymm tea is the information card that accompanies each tea. There is a wealth of knowledge contained on these 4" x 5.5" sheets of paper. For example, black tea from Yunnan is called Dianhong which means "Yunnan red" in Chinese. Did you know this? I didn't before I read it on the card. In my review of the Daxueshan I will include a factoid or two from the tea info card.